Leucistic axolotls have a white (or slightly pinkish) body and black eyes. They often have some black speckling, especially on the face or the spine. This black speckling may increase or decrease over time. Leucistics may or may not have a shiny ring around the pupil of the eye. They may or may not have shiny patches on their body. If it's a melanoid leucistic, it will lack the shiny eye ring and shiny skin patches. This extra black coloring can increase or decrease as the axolotl grows. 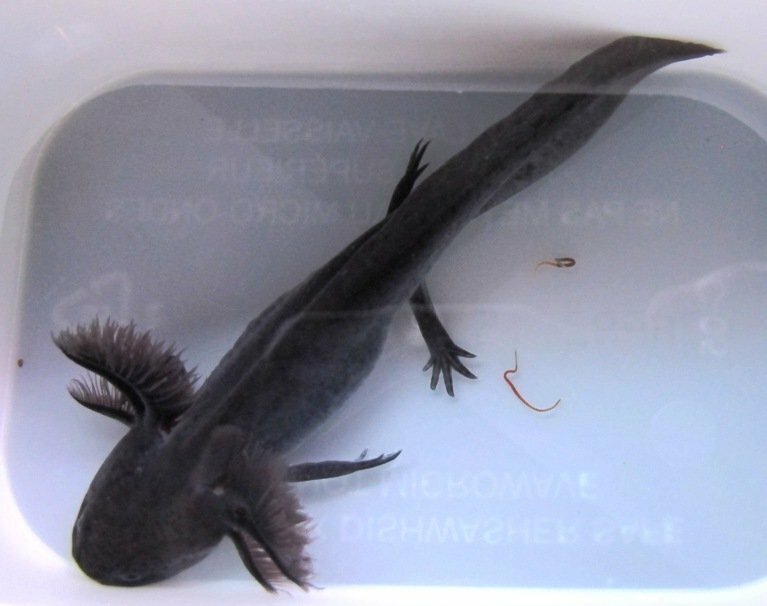 This extra black coloring will be more pronounced when the axolotl is on a dark substrate and may disappear completely if the axolotl is kept on a white or light-colored substrate (see note below on black melanoid). Black melanoids have a dark or black body with a lighter-colored belly. They lack the shiny ring around the pupil of the eyes and they have no shiny patches (iridophores) anywhere on their bodies. 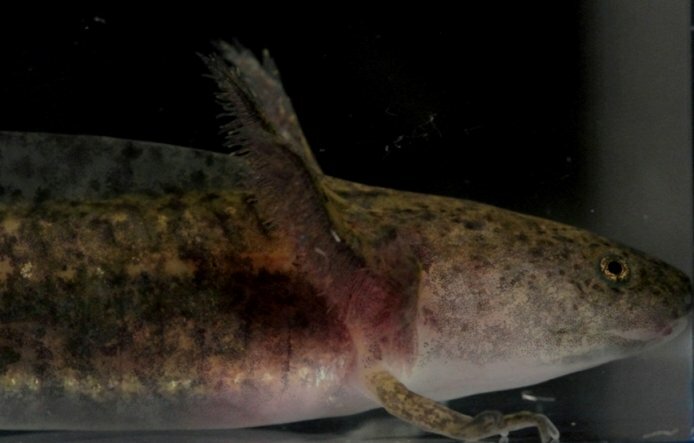 Sometimes a dark wild type axolotl is mistakenly identified as a black melanoid. The way to avoid this mistake is to look closely at the eye. A dark wild type will have a shiny ring around the pupil of the eye. A melanoid will not have this shiny ring. A black melanoid can sometimes look brownish or gray, especially when using a flash to take its picture. A commonly-overlooked fact about juvenile black melanoids is that they are highly affected by the color of the substrate they're on. They will try to blend in to it, so if you use a white substrate, the melanoid will lighten up to more of a light gray-ish color (often with dark dots). If you keep them on black substrate, they will be quite black. Colors in between white and black will cause them to lighten to various shades of gray. It’s interesting to note that they change back and forth (rather quickly) if you move them from a container with light substrate to one with black substrate, then back again. If your tank is bare bottom, then whatever color shows through from underneath the tank is what counts as substrate color. If your tank is on a stand, you can tape a piece of black paper to the bottom of the tank (on the outside, of course) and this will help your axolotl be dark black. As they grow up, they usually turn black regardless of what color they’re on, but they do it at different rates, so you can’t predict at exactly what size they’ll do this. The ones shipped from The Axolotl Factory are jet black when they leave here, but may change depending on your setup. 1. Make sure it does not have a shiny ring around the pupil of its eyes. It also must have no shiny light-colored spots (iridophores) anywhere on its body. 2. Put it over a black bottom and see if it turns black within about an hour. NOTE: People often use the term "melanoid" to mean "black melanoid," but this can be confusing because there are also leucistic melanoids, white albino melanoids, golden albino melanoids, and copper melanoids. 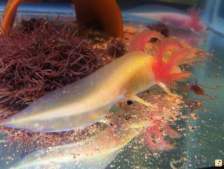 "Melanoid" means the animal has more dark pigment and no iridophores, which only means "black" if the animal doesn't also carry two albino and/or two leucistic genes. We get some interesting heavily-marked melanoids in some of our spawns. This one, for instance. Both parents are black melanoid. The camera flash is making this one look washed out. It's black with dark green patches. Contrary to what some people believe, black melanoids are not necessarily a uniform black. 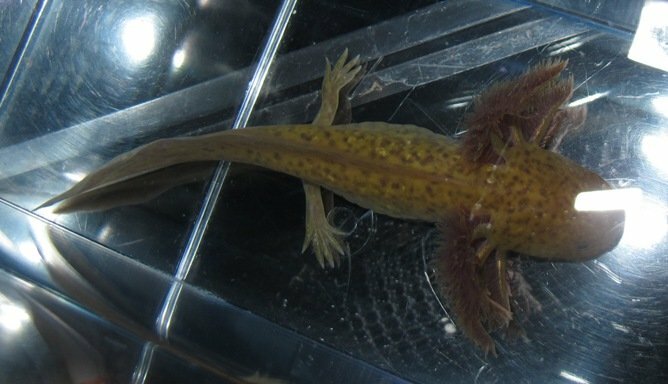 They almost always have dark dots, which may be hard to see when the axolotl is very black. And they often get patches of brown, gray or green. The definition of "melanoid" doesn't necessarily mean they're all black. It does mean they have no iridophores (shiny patches). 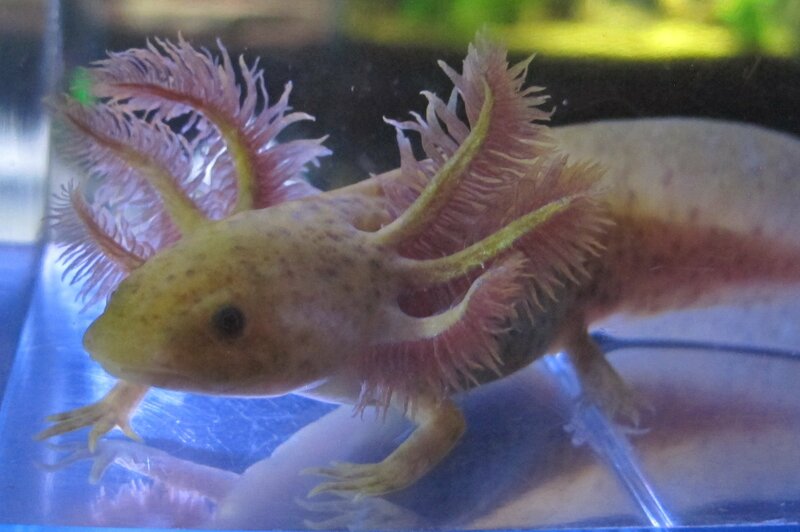 Wild type axolotls are usually some shade of brown, green, or olive. They have a shiny ring around the pupil of the eye and shiny light-colored spots or patches randomly scattered on the body, legs, and gill covers. They are similar to black melanoids in that when they're young, they will lighten up or darken to try to blend with whatever substrate they're on (see note above for black melanoid). Golden albino axolotls have a golden-colored body with pink or red eyes. They also have a shiny ring around the pupil of the eye and shiny spots or patches randomly scattered on their body, legs, and gill covers. When they're hatched, they're almost white in color and it can be virtually impossible to tell them apart from white albinos. As they grow, the yellow color starts to deepen. Some become quite yellow, but most seem to be a medium golden color. 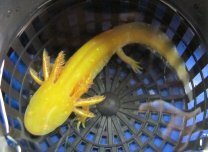 Melanoid golden albinos are more yellow than a white albino, but less yellow than a regular golden albino. They're usually a light cream color. They sometimes have splotchy yellow patches on a white background, like the pictures above. Because they're melanoid, these goldens have no iridophores. Because they're melanoid, they also produce fewer xanthophores (yellow pigment) than a regular golden albino. GFP stands for green fluorescent protein. 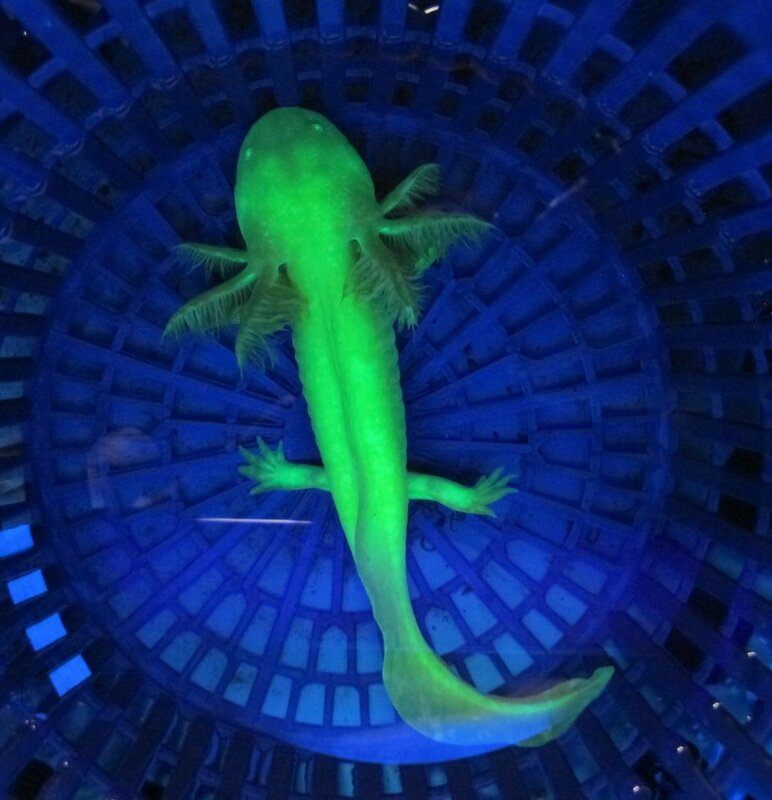 These axolotls will glow a bright green under blacklight. Blacklight is stressful to them, so they shouldn't be exposed to it for more than a couple of seconds at a time. They sometimes have a greenish tint even under normal room lighting and the eyes of the non-albino GFP's have a green glow even under normal lighting. 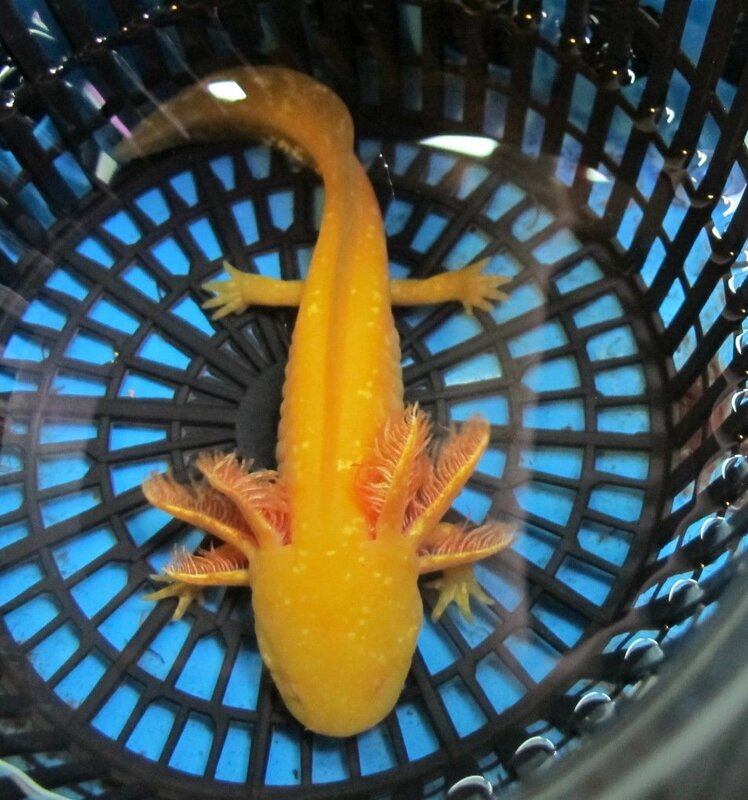 GFP occurs naturally in some species, but it was initially artificially introduced into axolotls. It's passed down now from GFP parents to their offspring, although not all the offspring will necessarily carry it. White albinos have a white-ish body and red or pink eyes. The body color may range from slightly pinkish to even cream color. They may or may not have the shiny eye ring and shiny spots on the body. When they have bright red gills like the one in the above picture, they can be quite striking looking. 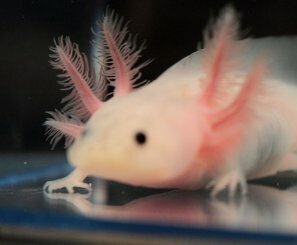 Copper axolotls are a special type of albino. They come in a range of copper, some quite light and some darker (see above photo). They have a slightly reddish eye. We divide them into two groups; "light coppers" and "coppers." Het coppers are heterozygous for copper. This means that they look like normal wild types, but they carry the copper gene (they had one copper parent). If you breed two het coppers together, approximately one-fourth of the babies will be coppers. 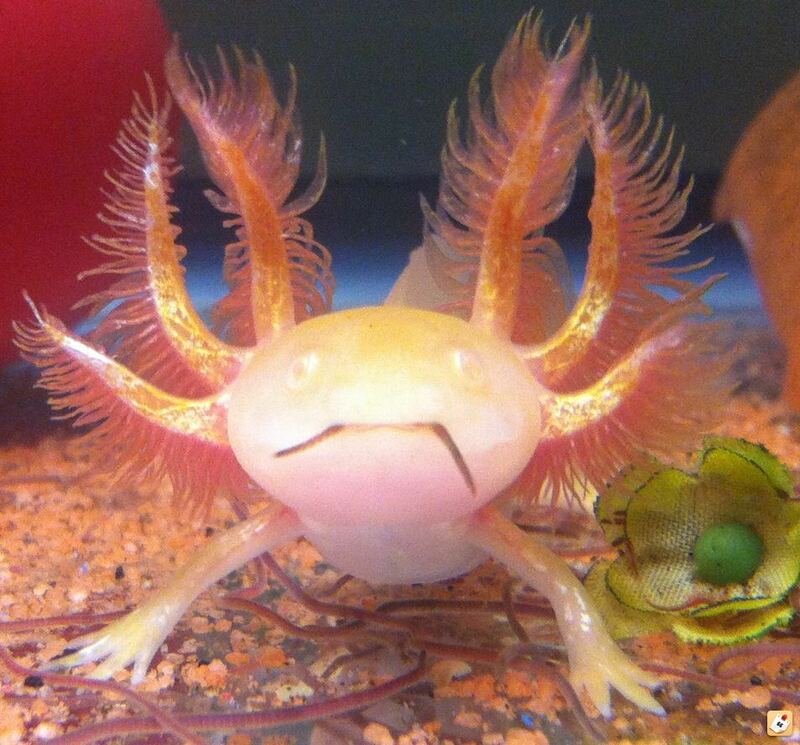 RLG is a term we created here at The Axolotl Factory to describe a certain percentage of our axolotls that have Ridiculously Long Gills. 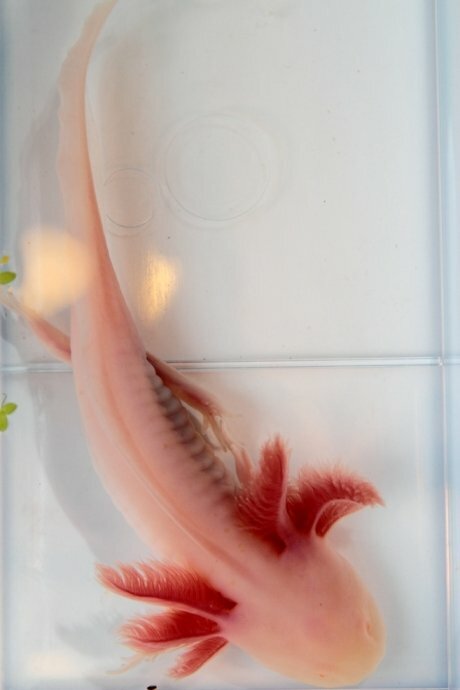 All of our axolotls typically have long, beautiful gills. But some are so long they're almost freaky. Is there such a thing as gills that are TOO LONG? These gills are so long that they can't hold them upright and they kind of flop to the front or side. 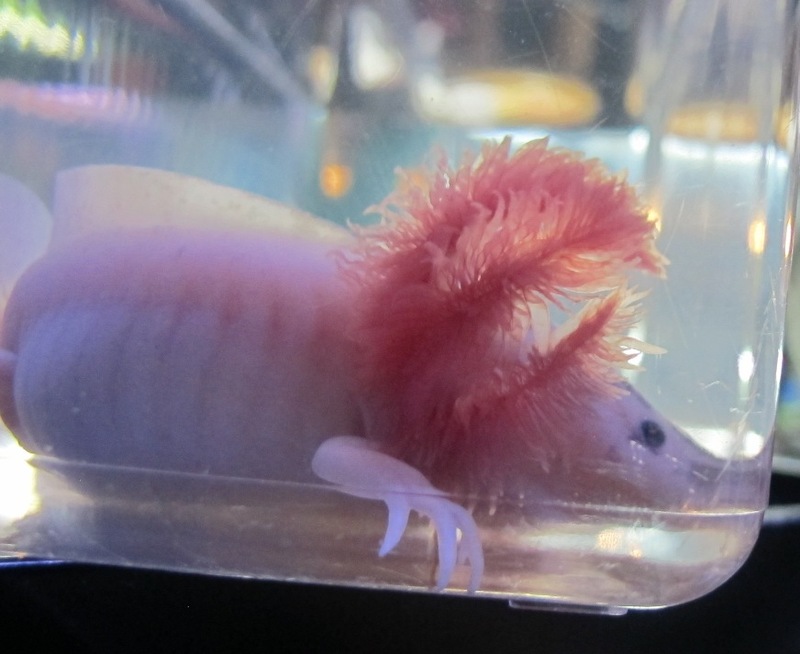 This is not the same thing as an axolotl with forward-facing gills due to illness. When kept in ideal conditions, the gills seem to get even longer as they grow. Usually there's not time to sort these ones out from the rest, but occasionally we will pull one out, take some pictures, and feature it on our Specials page. 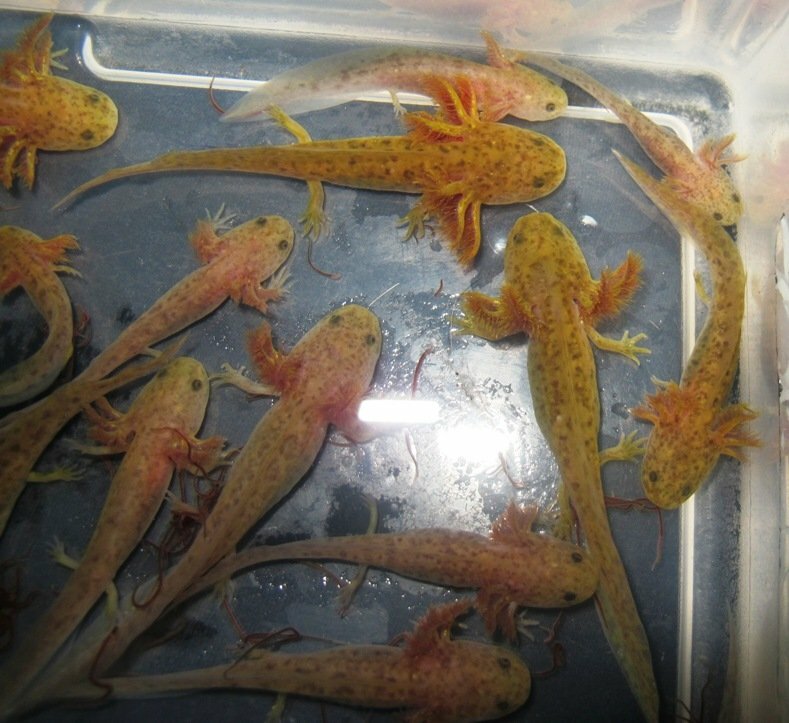 Here are some samples of our RLG axolotls.